Here’s the tricky thing with car names: Sometimes they mean things. And so people project those meanings back onto the object or person bearing the name and sometimes the two don’t always align. Like with Kia’s new Masterpiece concept. That is its name. It definitely aims high, to say the least. 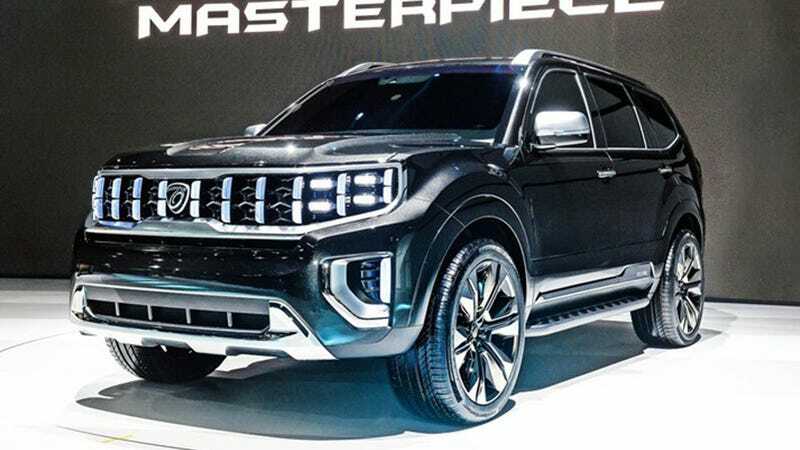 The Masterpiece was unveiled at the 2019 Seoul Motor Show today and is described as a “large SUV body with a luxurious, high-tech cabin” and has all-wheel drive, according to Kia’s press release. It seems that although Kia already offers the Telluride, it’s not quite done with big SUVs just yet. Indeed, Kia says that the Masterpiece is hint at how the company might further use its design elements for the segment. No further stats were offered about the Masterpiece. If Kia decides to build the thing (and it does look extremely production-ready), it’s most likely going to be the all-new Mohave, an SUV that Kia’s been selling in Asian markets. In the U.S., the Mohave was known as the tragically short-lived Borrego. It’s not clear if Kia intends on keeping the Masterpiece name or not. Regardless, I can’t help it, I just can’t see past the fact that Kia has called its own concept a “masterpiece.” Doesn’t that just invite more scrutiny than usual? I certainly don’t think it’s a masterpiece and I have a hard time imagining that anyone else would read that name and not get hung up on it. Unless! Unless this is a power move: calling your concept something outrageous just to flex on everyone else. If that’s the case, then I wholly welcome it and think that it should be a more common practice. Getting flexed on builds character. It’s good for you. In other news, you will now all address me as Ultimate Supreme Leader of the Universe Lee.